A week ago I ran, with three of Lewes’s redoubtable Twitten runners, Duncan Rawson, Rob Read, David Stacey, the Eridge Park 10 Trial Challenge. The mud in the shower has gone, my toes are more or less dirt-free and I can knock the dried filth off my trail shoes, so it may be time to record the race. Eridge Park is a couple of miles south of Tunbridge Wells, and owned by the Marquess of Abergavenny. You may wonder why a Welsh peer should have his residence in Sussex, but that’s feudalism for you, and explains the Abergavenny name on Sussex pubs, and the frequent use of the family name, Nevill, in local toponyms. This was the nineteenth renewal of the race, though I am ashamed to say I had never heard of it before, and only discovered it through a leaflet left on my car windscreen at another event. The leaflet promised views, hills and mud. What could be more agreeable? The morning of the race was cool, though bright. We assembled in parkland. Numbers were issued in order of surname, which meant that Rawson, Read, Roper and Stacey were all close together. Some of us went for warm-up runs. I abstained; I knew the race would be hard enough without adding extra distance. We were sent on our way with an unorthodox start, a banner unfurled from the starting rostrum bearing the word bang. And we were off, a good wide start line, and a gentle descent. The organisers have gone to some trouble to name give parts of the course whimsical names, such as the Tomb of the Unknown Harrier and the Leap of Death. It was near the entrance to the Lost Wood, I believe, a little over four miles in, that I lost my battle with the mud and fell face first into the swamp. My shoes stayed on, though, thanks to the looped lacing I use, and it was a soft landing. I rose and carried on. In a curious way, it was a liberating experience; I now knew that the mud had done its worst. I had to put up with jocular remarks from marshals, such as one who accused me of stealing his Lordship’s mud, and, my hands being coated, the jelly babies I ate at the next water stop had a crunchy garnish. On I went. The highest point of the course dubbed Saxonbury 659, had a folly, a tower straight out of a fairy tale. In total I climbed 1,362ft. I knew I was slow, and the last few miles were hard; they included a ridiculously steep ascent, lots more mud, and a sudden heavy downpour of rain, though I was in the woods for this and protected from the worst. The last few hundred yards twisted and turned, until the cricket ground came in sight, where a game was in progress. I had very little left, but managed to hold off two ladies close behind and finished in 2:37:04. My fellow Seaford Strider Natasha Swan finished in 1:47:18. As for my fellow Twitten runners, Rob finished in 1:39:18, David in 1:45:20 and Duncan in 1:49:43. At the finish there was beer, pints of Larkins Traditional, and cake. With thanks to Rob, the master of post-run group selfies, here are some photographs. The race was splendidly organised by Tunbridge Wells Harriers, and well and enthusiastically marshalled. Duncan, who takes over the reins as Race Director of the Moyleman marathon for the 2018 race, was muttering about coloured tape as we left. Today I ran the last race in the East Sussex Cross Country League for 2015-16. I pre-entered, and a mere £12.50 entitled me to race in six events, and use the same number for each. Put that in your pipe, expensive events, and smoke it. 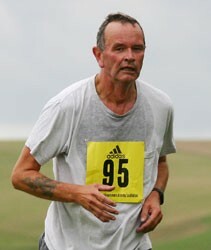 In the event I only ran five of them, as I was away for the foggy Firle Beacon event. Pett was a fitting climax, with lashings of mud. To compare and contrast with the Twitten runs, if you were to take Lewes’s twittens, slather them in mud to the depth of a metre, have the King’s Troop of the Royal Horse Artillery ride up and down a few times, import ferocious badgers from the countryside and have them dig their setts along the way, and embed roots and fallen boughs, you would have something like the right effect. We darted in and out of woodland, up and down hills, and round the perimeters of fields. It was warm but windy, and the gusts pulled at my number. Fortunately it stayed on, unlike some events when I have finished holding my number across my chest, as if making obeisance to some Asiatic despot. At the end, the prize-giving. Lewes AC won the club championship by one point, and I am delighted to report that my Seaford Striders comrade Peter Weeks was first in the over 65 category. Today I took part, as one of two representatives of the Seaford Striders, in yet another cross-country event, the Sussex Masters. The first race was for men over 50 and over 60; falling into the latter class, I thought I must find a spavined 69 year-old to best. Hubris, hubris. We assembled in a muddy field above Lancing, and set off at the sound of the pistol. The first uphill was taxing, but I was by no means last, and could hear other runners behind me wheezing and grunting. As we reached a flat section, they recovered themselves and overtook me. Perhaps this would not be so easy. It wasn’t; that was the last time I saw them. The course consisted of one shortish loop of a mile, followed by two longer ones of around two miles each. Once I’d completed my first circuit, I found that the longer one consisted of a very long ascent, then a turn into a ploughed field, and a muddy and bramble-filled descent through some woods. As I completed my first lap of the longer loop, the ladies were assembling for their start and, as I ascended the hill again, the faster ladies flew past. My chivalrous instincts caused me to throw myself into the brambles as one lady tried to pass me on a narrow stretch in the woods, and, while I didn’t notice anything at the time, I finished with blood running down my arm. As I crossed the finish line I heard the timekeeper call out ’01’. I think this means I was just outside an hour. Though my Garmin recorded a time of 59:43, I think I fumbled at the start, so I fear I probably was outside an hour. I went home to wash off the blood and mud. I am sorry to say I shall miss the next East Sussex Cross Country League event, at Firle Beacon on 31 January, but I shall have cleaned my trail shoes in time for the final race of the season, at Pett, east of Hastings.